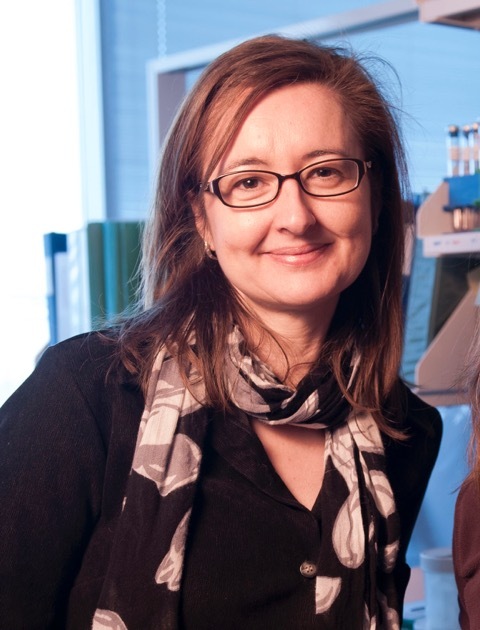 Dr. Gemma Reguera is an Associate Professor in Microbiology and Molecular Genetics, as well as Plant, Soil, and Microbial Science at Michigan State University. She completed her undergraduate studies in Biology at the University of Oviedo in Spain and received her PhD in Microbiology from the University of Massachusetts-Amherst. Afterward, Gemma conducted postdoctoral research at Harvard Medical School and the University of Massachusetts-Amherst before joining the faculty at MSU where she is today. Gemma is with us today to tell us all about her journey through life and science. When Gemma wants to disconnect from her scientific side, she likes exercising at the gym, doing Zumba, reading, and cooking. Gemma also enjoys spending free time with her family, and she often hangs out with her 11 year old son and goes on walks with their adorable rescue dog. As a microbiologist, Gemma studies small organisms like bacteria. Most people are familiar with bacteria that cause disease, but Gemma studies the ones that help us by cleaning up wastes and pollution. She learns about what these organisms do in the environment, figures out which ones can be brought into the lab, and finds ways to use these microbes to solve real-world problems. When Gemma was 6 years old, she watched a documentary about Louis Pasteur and decided she wanted to be a microbiologist. She was mesmerized by images of Pasteur working with his petri dishes of bacteria and fungi. In addition to being a microbiologist, she also entertained dreams of becoming a dancer, a singer, a painter, and a physicist, among other things. However, Gemma’s high school biology teacher was instrumental helping her realize her passion for biology and microbiology. At the time, there were high unemployment rates for biologists, and there was a lot of pressure to pursue a medical degree instead. Gemma’s fascination with biology persisted, and she switched out of the medical program and into the biology program at the last minute. In science, you have to contend with a steady stream of negative results, exposure to criticism through peer review, and rejected applications for funding. The funding situation for science has been particularly challenging lately, which makes it hard to provide support for talented students and postdocs. Gemma has been able to diversify her funding sources by applying for commercialization grants. This has been really rewarding, but it has also taken a lot of time and required her to learn a lot more about industry and business. For Gemma, her biggest successes in science are the students and postdocs she is able to mentor. Each person comes into the lab with a different background, and it is exciting to watch them develop into independent scientists. Mentoring is a big priority for Gemma, and she is able to leverage both the positive and negative experiences she has had in different labs to shape her own lab environment and mentorship style. The Psychopath Test: A Journey Through the Madness Industry by Ron Johnson. Last January, Gemma was invited to present at a Gordon Research Conference on Metals and Biology in Ventura, California. Most of the audience members were chemists, so she spent a lot of time beforehand preparing herself to answer questions from a chemist’s perspective. This was an exciting opportunity to participate in stimulating conversation with people coming in with different experiences from a different field and also to share her perspective as a microbiologist with them. Gemma used to invite all the lab members to a big Thanksgiving celebration at her home. She worked hard to accommodate the different dietary restrictions of all of the lab members. One year, Gemma was proud of her efforts to ensure dairy-free and Kosher meal. When she opened the oven to show off her turkey, they all had to laugh because her prized turkey had been wrapped in bacon. The humorous story of her culinary slip-up has been passed down through multiple generations of students now. She and her colleagues actually have a tradition of sharing photos of their bacon wrapped Thanksgiving turkeys each year. One of Gemma’s mentors told her there is no such thing as luck. What you call luck is when preparation meets opportunity. Be the best you can be, and opportunities will arise. Remain open-minded in your research and your life. If you become narrow-minded, you may miss what science is really about. Gemma is an environmental microbiologist who became a Spartan in 2016. Her research focuses on investigating the energy conversion reactions catalyzed by microorganisms in natural and anthropogenic systems. Her interests go beyond the basic research and seek to develop sustainable technologies that harness the natural processes for bioenergy and bioremediation applications. Of particular interest is the coupling of carbon cycling to metal reduction by microorganisms, which the Reguera lab is harnessing to develop technologies for the environmental remediation of environments impacted by toxic metals and energy recovery from agricultural and industrial wastes. At the core of these projects is the development of genetic engineering approaches to understand the biological mechanisms underlying microbial functions and to manipulate their properties for biotechnological applications.